We previously discussed the Hebrew word for fruit - p'ri פרי. 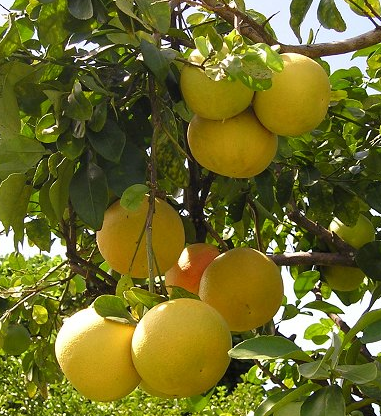 Now lets look at a particular fruit - eshkolit אשכולית - "grapefruit". At first glance this seemed strange to me. Both grapefruit and eshkolit were connected to "grapes"; eshkol אשכול means "cluster", as in a cluster of grapes (and is related to sagol סגול - "violet"). But I had a hard time with the suffix ית "-it". I assumed it was a diminutive - a kapit כפית is a smaller spoon than a kaf כף, and a sakit שקית is a smaller bag than a sak שק. Grapefruit is called grapefruit not because it is in any way related to grapes, which it is not, but because it grows in bunches, as grapes grow. "Grapefruit" first appeared in English around 1814. The Oxford English Dictionary sums up grapefruit thusly: "The globular fruit of Citrus paradisi, having a yellow skin and pale yello (occas. pink), juicy, acid pulp." When the pre-State Israeli farmers (in the 1920s) wanted to give a name to the new fruit they had brought from America, they wanted a Hebrew version of "grapefruit". They considered *eshkolia אשכוליה (like agvania עגבנייה for tomato) but rejected it because it sounded like a diminutive! So they chose eshkolit, which basically means a fruit "related to eshkol, cluster"1. My initial impression that the suffix "-it" meant primarily a diminutive was incorrect. It is used to form abstract nouns, or just other nouns connected to the root, going all the way back to Biblical Hebrew, and continuing strongly into Modern Hebrew and Hebrew slang. In Biblical Hebrew we have rosh ראש - "head" and reshit ראשית - "beginning" (in the first word in the Torah!) and shear שאר and shearit שארית - both meaning "remnant". Already here we can see that it is not easy to define how the suffix "-it" changes the original word. In Rabbinic Hebrew shahar שחר - "dawn" and erev ערב - "evening" become shaharit שחרית and arvit ערבית. Feminine forms of nouns also are created using "-it", particularly with professions, like sachkan שחקן (actor) and sachkanit (actress), and meltzar מלצר (waiter) and meltzarit מלצרית (waitress). Languages take the names of nations and add "-it": Sefard (Spain) ספרד becomes Sefaradit ספרדית, Tzarfat (France) צרפת becomes Tzarfatit צרפתית. (Using -it and not -ah allows us to distinguish between a French woman, a Tzarfatiya צרפתיה, and the French language, Tzarfatit). It can be used to create a tool or device - such as with masa משא - "burden" becoming masa'it משאית - "truck", and cheshbon חשבון - "account" becoming cheshbonit חשבונית - "receipt". Many more examples, particularly in recent Hebrew usage (such as in brand names, children's names, place names) and general slang can be found in Dr. Malka Muchnik's interesting article "סופית קטנה שהגדילה לעשות" in Helkat Lashon 23, 1997. Incidentally, many years ago I learned one of my first lessons about how words are borrowed from one language to another, particularly words for foods (one of my favorite topics), from eshkolit. I can't count how many times we've seen similar transformations while tracing the history of words. But it was fascinating to see it happening in real time! 1. In an article in the newspaper Yediot Achronot, October 16, 1981, there is some disagreement about who can claim the coinage of eshkolit -Yisrael Weinberg or Pinchas Riklis. Both lived at the same period, which makes it hard now to determine who is right.